Some turns of events in the technology world are truly surprising. Who knew that a couple of guys starting up Google would hit it as big as they did? Who imagined that Facebook or Twitter would turn into sensations? Who had any inkling about how successful the iPhone would be? OK, that last one... not so much. From the day it was announced, the iPhone was a pre-release sensation. One didn’t need one’s finger on the pulse of technology to see how popular it was going to be, and to predict that its popularity would go beyond even what Apple, despite its irrepressible optimism, expected when they announced it. And it didn’t take a Nobel laureate to guess that the crush would continue with each new version of the phone. “It’s so slow, it feels like I’m on a dial-up modem,” he said. Shazam, an application that identifies songs being played on the radio or TV, takes so long to load that the tune may be over by the time the app is ready to hear it. On numerous occasions, Mr. Sbicca says, he missed invitations to meet friends because his text messages had been delayed. And picking up a cell signal in his apartment? “You hit the dial button and the phone just sits there, saying it’s connecting for 30 seconds,” he said. None of this snuck up on AT&T. They should have been working on building their network up for this in the time between their deal with Apple and the announcement of the iPhone in January, 2007. Failing that, they should have started when they saw how much enthusiasm the announcement generated before the release of the first phone at the end of June, 2007. They should certainly have gone whole hog on it when they realized that every man, woman, and child within a two-day drive of an Apple store was camped out on the street for a week, hoping to buy three of them. About a year after the first phone went on sale, the 3G version came out, in July, 2008. The new, updated 3GS came out this June, and there were more than 20 million iPhones out there before the 3GS release. How fast will the new iPhone run on AT&T’s 3G network? Plenty fast, according to promises made by AT&T mobility chief Ralph de la Vega at Morgan Stanley’s annual Communications Conference on Wednesday [14 May, 2008]. Throughput of 7.2 Mbps would put the 3G iPhone within spitting distance of Wi-Fi speeds, which typically run between 6.5 Mbps and 20 Mbps. My first mobile phone was a piece of garbage and I knew it. But it was free, so I didn't complain too loudly. Over the years I upgraded a couple of times, and I liked each phone better than the last. It wasn't until I bought an iPhone that I truly loved my mobile phone. That said, I hate AT&T. I held out for the 3Gs (I was waiting for a 32GB iPhone so I could replace my iPod altogether and not have to carry two devices), which I bought on the day it came out in June. In the 3 months I have been with AT&T, I have had more problems and issues than I ever did in 6 years of being a T-Mobile customer. What irks me most about it is (A) exactly what you said: That this massive network load didn't sneak up on AT&T, and (B) I'm paying about twice as much for worse service. Although I've never had a dropped call, I have had texts that were hours late, and browsing the Internet can be excruciatingly slow, even on 3G with a full signal. 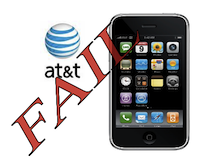 "AT&T was happy to sign up as many iPhone customers as they could. Their mentality was probably very similar to gyms who sign up as many people as they can in January when everyone makes their New Year's Resolution to lose weight. Gyms are packed the first few months after January but then there's a drop-off in attendance, because people tend to slack off, so even though the gym might 'overbook' their spaces, it's only being used by a fraction of the members."